"The facility that we were liberating was a joint field hospital for civilians and orphanage run by a group of Australians, which had been taken over by the Vietcong. 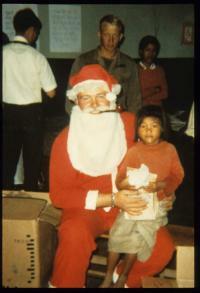 With our presence, there was no resistance and the Vietcong left allowing us to regain control of the facility and to distribute gifts to the children for Christmas. 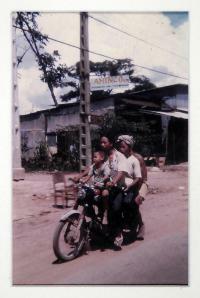 As you can see from the photographs, we were still uncertain as to the dangers of Vietcong resistance so everyone was on alert. The reaction of the young children was both happy and sad. They were terrified at the sight of a man dressed in red with a white beard. Santa Claus was not a known to them, but they were very happy to receive our gifts. So were the doctors when we delivered new medical supplies."